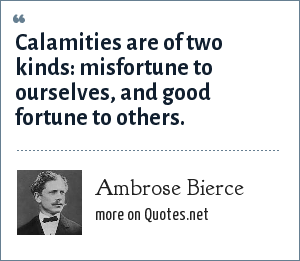 Ambrose Bierce: Calamities are of two kinds: misfortune to ourselves, and good fortune to others. "Ambrose Bierce Quotes." Quotes.net. STANDS4 LLC, 2019. Web. 23 Apr. 2019. <https://www.quotes.net/quote/50284>.